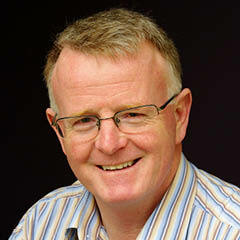 A law degree from Adelaide University and several years of work as a lawyer came before Paul completed a theological degree at Moore College in Sydney. He joined the Trinity Church Adelaide staff team in 1988, was appointed Rector in 1993, and became Senior Pastor of the Trinity Network when the first church plant commenced in 2001. Paul is married to Sue (also a lawyer), and they enjoy time with their three adult children and (so far) two grandchildren, but his desk is so crowded that Sue’s photo sometimes has to live in his desk drawer! Still a regular at the gym, Paul likes most sports and follows footy (Adelaide Crows), cricket (Australia), and both codes of rugby. He also enjoys grocery shopping (! ), flat whites, and murder mysteries. Paul’s great desire is to help God’s people grow to maturity and to reach out to others with the gospel. In addition to his teaching, preaching, and speaking commitments, he provides strategic direction to the Trinity Network and recruits leaders for gospel work. He also encourages and liaises with many organisations with whom we share gospel partnerships.